Today I am here with simple yet delicious combo meal, that is Dahi Aloo with Jeera Rice. Potatoes has always been favourite in Indian cooking because you can do so much with them. So coming to the recipe. This recipe is such that boiled potatoes are cooked in spicy and creamy yogurt with handy spices, so this is called as Dahi Aloo. People calls out this recipe with different names but method and taste remains same. This gravy makes the best combination with Jeera rice. And other option is can be served with puri or plain parathas. Boil the potatoes and thoroughly mash one potato and mash the others to bite size pieces. Keep it aside. Combine yogurt and water into one bowl and whisk together without leaving any lumps. Heat oil in a pot on medium flame and add cumin seeds. Once the seeds start to pop, add turmeric and coriander powder. Mix and add the potatoes. Mix potatoes well with spice powder. Add in yogurt- water mixture and mix well with the potatoes. And bring the gravy to a rolling boil and then add salt and crushed red chili. Dahi Aloo is ready to serve with mild flavored rice. 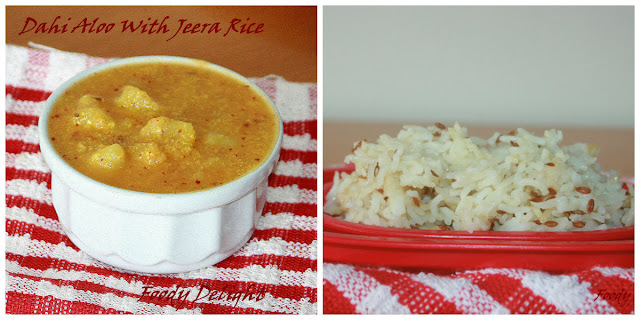 I serve with Jeera rice. Set electric cooker on COOK mode. Heat ghee into the cooker and add cumin seeds. Fry the seeds till they slightly changes their colour. Mix in washed and drained rice. Stir well and fry for 1 minute. Then add water and salt. Mix well and cook it till done. This time I prepared jeera rice in electric cooker. It was very easy. In same way one can prepare on stove top cooker. Dahi aaloo - a simple and quick recipe. With less spices and it looks good!